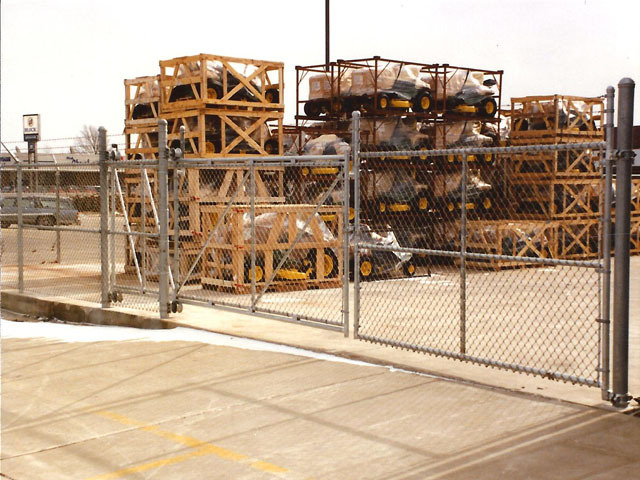 The Elyria Fence Company has been custom building industrial cantilever slide gates since 1932. All of our commercial slide gates are built to spec using only American Made Steel and aluminized fabric. The aluminized fabric will give you the best of both worlds. You're getting the strength of steel, along with corrosion resistant qualities of aluminum. There are numerous reasons that we do not use galvanized fabric. To mention just a few - galvanized fabric has a zinc oxide film that forms on the galvanized fencing which is water-soluble. That means that rain and humidity will disolve the film; rusting and corosion soon follow. Galvanized fencing also offers little protection against fires. Fire vaporizes the zinc coatings on the galvanized fabric. Aluminized steel fabric is capable of surviving fire due to the high melting point of the aluminum finish. This will ensure that your facility's security gates and perimeter enclosures will be in beautiful condition for decades. All of our slide gates are available with or without and electric operator. For the convenience of our customers we provide installations year around, however, be sure to plan ahead on your installation. The spring and summer months are very busy, and this will allow us to accomodate for your deadlines and other requirements. Contact one of our estimators for a free appointment to discuss your construction and specification requirements. Don't be fooled by our name - Elyria Fence has been pleased to offer our cantilever slide gates and all other commercial security gates for installation in the following Ohio cities since 1932: Akron, Amherst, Ashland, Avon, Avon Lake, Bath, Bay Village, Beachwood, Bedford Heights, Belden, Bellevue, Berea, Berlin Heights, Birmingham, Boston Heights, Bratenahl, Brecksville, Broadview Heights, Brooklyn/Old Brooklyn, Brookpark, Brunswick, Carlisle Township, Castalia, Catawba, Chipewa On The Lake, Cleveland, Cleveland Heights, Columbia Station, Copley, Creston, East Cleveland, Eaton, Elyria, , Fairview Park, Fairlawn, Friendsville, Garfield Heights, Gates Mills, Grafton, Hinckley, Homerville, Huron, Hudson, Independence, Kelly's Island, Kipton, LaGrange, Lakeside Marblehead, Lakewood, LaPorte,Litchfield, Lodi, Lorain, Lyndhurst, Macedonia, Maple Heights, Medina, Milan, Monroeville, New London, New Russia Township, Northfield, North Olmsted, North Ridgeville, North Royalton, Norwalk, Oakwood, Oberlin, Ohio City, Olmsted Falls, Parma, Penfield Township, Peninsula, Pepper Pike, Pittsfield, Polk, Port Clinton, Put-In-Bay, Richfield, , Rittman, Rochester, Rocky River, Sagamore Hills, Sandusky, Seville, Shaker Heights, Sharon Center, Sheffield, Sheffield Lake, Sheffield Township, Sheffield Village, Solon, South Amherst, South , Spencer, Strongsville, Stow, Tremont, University Heights, Valley City, Valley View, Vermilion, Wadsworth, Wakeman, Warrensville Heights, Wellington, Westlake, West Salem, Woodmere.